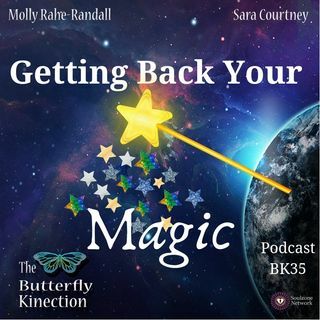 Molly and Sara talk about how we can get the magic back in our lives during this time of year and all year long. Sara and Molly both share their recent magical experiences at Disney World. Disney is magical because it is a place full of joy, happiness and love. All the experiences at Disney teach us that if we believe in ourselves, we can do or be anything. Often times, we think that because we are adults, we cannot experience magic at all or in the same way we felt it as a child. But, ... See More we all deserve and are capable of feeling the magic. Life is magical. There are so many magical moments that we miss along the way because we are so busy thinking about everything we need to do. We need to focus on enjoying the experiences. Molly and Sara talk about many different ways we can begin to experience magic again. Don’t try to take away other’s magic. Stop judging others. Celebrate them instead. It is important to remember that finding the magic is about celebrating ourselves and others. We need to stop judging people and how they look, act, and feel. We cannot create our own magic if we are trying to take others’ magic away. The magic comes from the experiences and memories we make with others and within ourselves. Magic also comes from the joy we feel within those experiences. We have to figure out how we find our joy. If we focus on material things instead of experiences, then we don’t tap into our heart and soul and truly experience magic. We need to relish time with family and friends. The experiences we have of giving a gift to someone is what’s important, not the actual gift itself. If we create those important experiences and make memories with the people who are important to us, find the joy in everything we do, then we can begin to put the magic back in our lives today and every day.